An Unidentified 04-Reg VWL passed along Evelyn Street, Deptford fifteen minutes ago presumably going to Thamesmead to start service on N1. 10187 working the night 269. Also saw an N3 going to Kennington Lane via Elephant & Castle along with the N109 going through there too. That's where those routes terminate on New Years Eve and the subsequent hours after. Earlier on, the 3, 59 & 159 were terminating at Kennington Lane too. Though their destinations display as Kennington Lane the buses on this occasion do that northbound diversion loop from Kennington Park via Elephant and St Georges Road to the Imperial War Museum, standing on Lambeth and/or Kennington Roads. 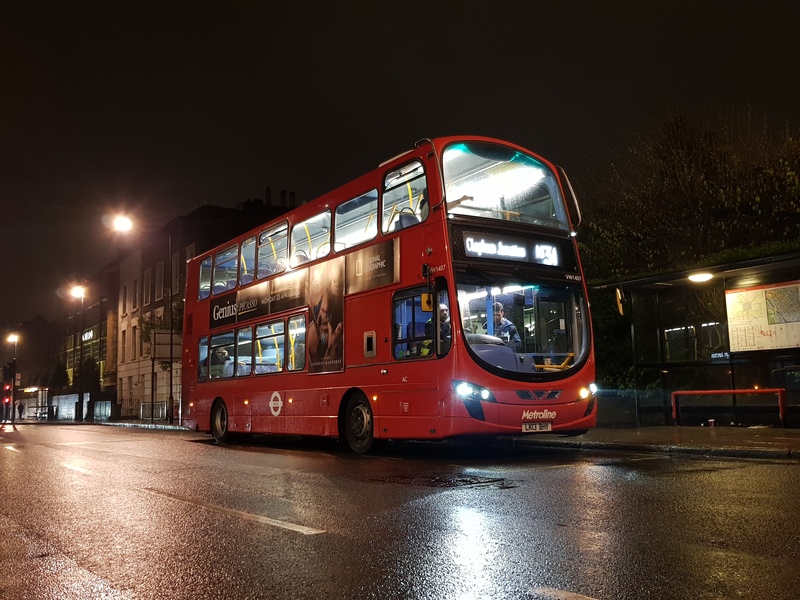 This allows buses to get that bit closer to Central London for NYE into NYD. They're also able to serve most of Kennington Road on their return journeys.